Whenever sports fans, especially ones from different generations get together, you can be sure the topic of who was the “greatest to ever play” a particular sport will come up. In my house, I listened to countless stories of the great Joe DiMaggio; of how he transcended the sport with his grace, style and ability to seemingly always come through in the clutch. Never mind that baseball historians will disagree as to his true place in the sport’s pantheon – to my dad, growing up Italian in Providence, RI, there was only one true superstar and that was Joe D. It’s subjective, of course, and those beliefs are sometimes hard to shake no matter what the facts may bear out. To be sure, there are some inescapable truths, borne out by the numbers. In baseball we’ve come to memorize records, almost as we would our parents’ names and our own birthday. 714 home runs, later eclipsed by 755 and 762 (sort of), .406 batting average, 511 wins and yes, the 56 game hitting streak are all greeted with instant recognition and immortality. And baseball isn’t alone; football has Emmit Smith’s rushing record (18,355 yards), Drew Brees’ 52-game consecutive TD streak and, for the locals, there’s always 17-0. Professional hockey has its Canadiens, College basketball its UCLA, and the World Cup has Pele. Individual sports are similarly blessed with memorable insta-stats which immediately convey greatness upon those who hold them: Jack Nicklaus’ 18 professional golf majors, Roger Federer’s 17 tennis grand slam titles, even Rocky Marciano’s 49-0 record all stand as hallowed marks in their respective sports. 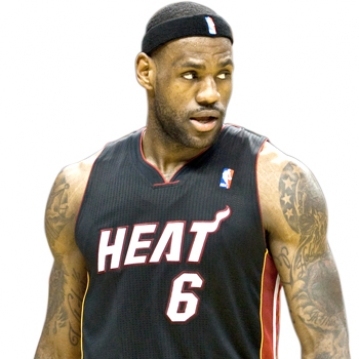 Which brings us to hoops – more precisely to professional basketball, and more specifically, to Lebron James. For whatever his detractors may say, at this very minute, LBJ is at the height of his professional power. He’ll never be more athletic, more cerebral, or more able to influence a game’s outcome than he is right at this moment. Very rarely does the confluence of such things happen at a time when we sports fans can experience them before our eyes, but if you love basketball, that time is now. Folks, this is like seeing Jim Brown in ’62, Sandy Koufax in ’65, Bobby Orr in ‘70, Joe Louis in 1938 – choose your immortal and their transcendent time, that’s what we have with King James every night he takes the court. So appreciate what we have; savor his special gifts. Because then you can tell future generations you saw the greatest.